There is something special about your initials and that is the reason to employ Benjamin’s monogram services. Whether it is a monogram for your shirt or your towels, you will proudly display the custom monograms from Benjamin’s in Pompano Beach. A dress shirt monogram is found to be a sign of great distinction on the cuff of a man’s shirt. It is a sign of class and nothing speaks louder to a man than being proud of his initials…they will always remain unique to him. Benjamin’s will custom-design those monograms for even more excellence! Let the expert tailors give you the best advice when you bring your shirts into our Pompano Beach shop. Custom monograms on your own towels are a true luxury. 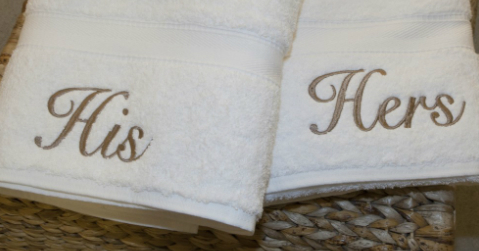 Why not give custom monogrammed towels as a shower gift for those newlyweds. Benjamin’s in Pompano Beach will consult with you on the monogramming etiquette and your gift will bring joy for years to come. Another luxury is the monogram that Benjamin’s will stitch on your bed linens. From His or Hers stitched on pillowcases to initials on the hems of the top sheet, you deserve a lovely treasure. Fill your life with the treasures of simple luxuries! Monogram service at Benjamin’s is just a short drive from ordinary to extraordinary. Monogramming the lining of your jacket or dress coat will undeniably keep your possession labelled. The monogram in a ladies coat speaks classiness and practicality. Quality monograms done at Benjamin’s in Pompano Beach will bring you pride and satisfaction. Turn your or daughter’s polo-type shirts into a fashion statement with a color coordinated monogram. Baby blankets and lap throws are more items that will look amazing when Benjamin’s capable seamstresses work magic with initials or full first or last names. Remember the prompt and personal monogram service at Benjamin’s in Pompano Beach and get ready for gift giving or some self-pampering!